Walt Disney Pictures Release the First Trailer for Tim Burton's Stop-Motion Animated Movie 'FRANKENWEENIE'! Walt Disney Pictures have released the first trailer for Tim Burton’s Frankenweenie. The stop-motion animated movie follows young Victor as he conducts a science experiment to bring his beloved dog Sparky back to life, only to face unintended, sometimes monstrous, consequences. 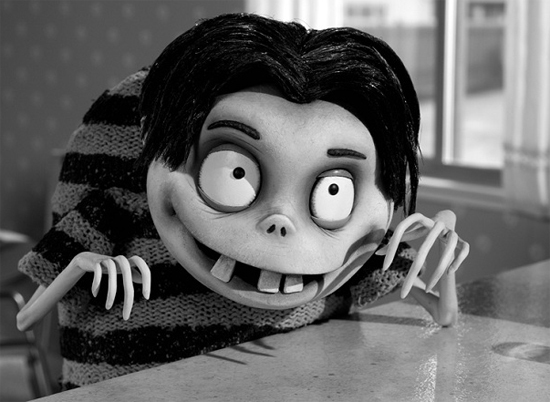 Burton originally came up with the idea for Frankenweenie in the early 80′s, he envisioned it as a full-length, stop-motion animated film. Winona Ryder, Martin Short, Catherine O’Hara, Martin Landau, Charlie Tahan & Atticus Shaffer lend to their voices to the movie which arrives October 5th in 3D & 2D. Hit the jump for the details. I'm reading: Walt Disney Pictures Release the First Trailer for Tim Burton's Stop-Motion Animated Movie 'FRANKENWEENIE'!Tweet this!